With city populations escalating abundantly, it's a challenge for futuristic farmers to figure out how to feed everyone with fresh ingredients. Now, researchers at MIT believes they have solved this quandary, using an innovative new system that they call CityFarm. 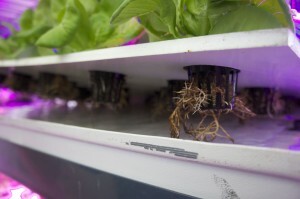 As reported by nationswell.com, the soil-free CityFarm project uses hydroponic (water flow) and aeroponic (water misting) systems to grow a collection of crops, leaving the price tag and messiness of soil out of the urban equation. Inventor Caleb Harper constructed a 7' by 30' plastic box in which he uses "pre-made weather" and is able to constantly monitor the plants' development, which is prodigious. Thanks to the artificial light and carefully-calibrated plant care, CityFarm can grow enough food for 300 people in a single 30-day cycle. Not only is the farm efficient and bountiful, it also saves resources. CityFarm's method of growth uses up to 90% less water than conventional methods. Harper believes eventually this could lead to a 98% reduction in agricultural water usage (making it ideal for water-deprived areas), as well as escalated nutritional value from the lack of pesticides and other soil contaminants. CityFarm currently grows tomatoes, lettuce, and herbs in their successful style. Pesky pesticides have nowhere to hide, as the plants' roots are fertilized with nutrients in water. Harper's plans don't stop at just the idea of the farm being like programming for a computer. He actually wants to create a program, in conjunction with MIT, that will act as "plant operating system software." This could be launched at other locations, such as an upcoming new attempt in Detroit, or it might help to regulate CityFarm's new plans to build vertically. A similar project is already underway in Japan. According to their website, CityFarm's technology combines their hydroponics/aeroponics with "novel environmental, diagnostic and networked sensing, control automation, autonomous delivery and harvest systems, data driven optimization and reductive energy design." Their high tech management along with their high yield of crops could be extremely beneficial for people living in any environment. The CityFarm website proudly extolls their multifaceted workforce, including "engineers, architects, urban planners, economists and plant scientists." If other cities and towns can adopt CityFarm's "grow it HERE and eat it HERE" mentality, a host of jobs as well as tasty meals will be aiding the new urban infrastructure. Who knows what ideas such a locally-laudable system may spout next? A serious salad bar is brewing at MIT.